The Washlet from Toto is one gift that will be appreciated long after Christmas. 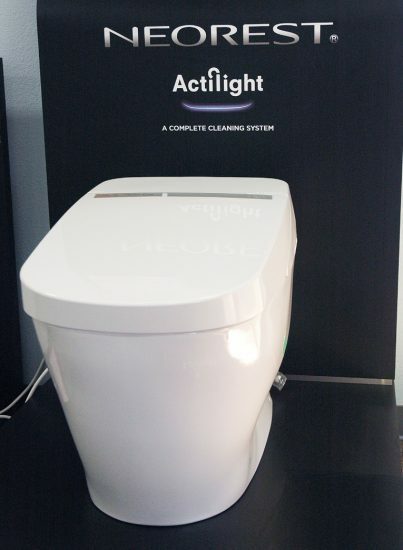 The Washlet model S350e incorporates features such as a sensor that opens the lid when a user approaches, a remote control that store custom settings for multiple users, a night light, and the use of electrolyzed water to clean the bowl between uses. Okay, so the bathroom probably isn’t the first place that comes to mind when planning your holiday gift-giving. However, when it comes to comfort, practicality and the all-important “cool factor,” the Washlet from Toto makes plenty of sense year-round. Ubiquitous across Japan for decades now, the Washlet – the automated, high-tech cleansing toilet seat with a built-in bidet – is making a push into the American market, and is winning over a new generation of fans. The top-of-the-line Neorest is a popular choice among Hollywood celebrities and music stars. Having lived in Tokyo and traveled extensively in Japan, I can attest that there are few joys in life that compare to a warm, cozy seat on a frigid morning. Sounds odd, I know, but once you’ve had the pleasure, anything else simply seems less civilized. The Washlet isn’t the exclusive domain of fancy hotels and luxurious resorts, mind you. It is commonplace in the average home in Japan. It’s standard in most new construction, and since it is built into the seat and not the commode itself, the product has found a welcome path into the average home in a country that is quite possibly the most hygienic on Earth. As a company, Toto began a hundred years ago as Toyo Toki K.K., Japan first manufacturer of sanitary fixtures. Founder Kazuchika Okura started his business in Kitakyushu in 1917, with the goal of making the common residence cleaner and healthier. Today, Toto is the world’s largest producer of bathroom fixtures – over $5 billion in sales annually. The Washlet has been a huge part of their success, continuing the mission of creating everyday luxury through a top-quality bathroom experience. The first Washlet – named from a quick tweak of the phrase “Let’s wash” – was introduced to the Japanese public in 1980. In keeping with Okura’s vision, the seat could be mounted onto practically any existing toilet, bypassing the need for troublesome or expensive remodeling. The first model had three functions – cleansing, drying and a heated seat. Since then, the Washlet has advanced in both technology and efficiency. Today’s models, such as the S350e, incorporate features such as a sensor that opens the lid when a user approaches, a remote control that stores custom settings for multiple users, and the use of electrolyzed water to clean the bowl between uses. 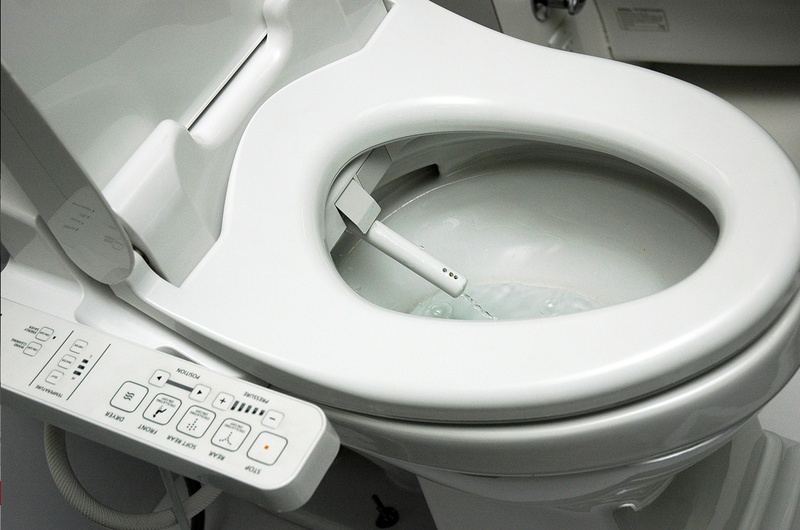 With more than 40 million sold, the Washlet and the concept of the high-tech Japanese toilet have even forged a place in popular culture. Scenes in movies like “Cars 2” and “Why Him” have had great fun putting unfamiliar Americans at the seat’s controls. Toto USA was established in 1989, in large part due to California’s drought conditions. Toto’s fixtures are well known for their water-conserving features, such as ultra-low-flush toilets and the world’s first electric sensor faucets. 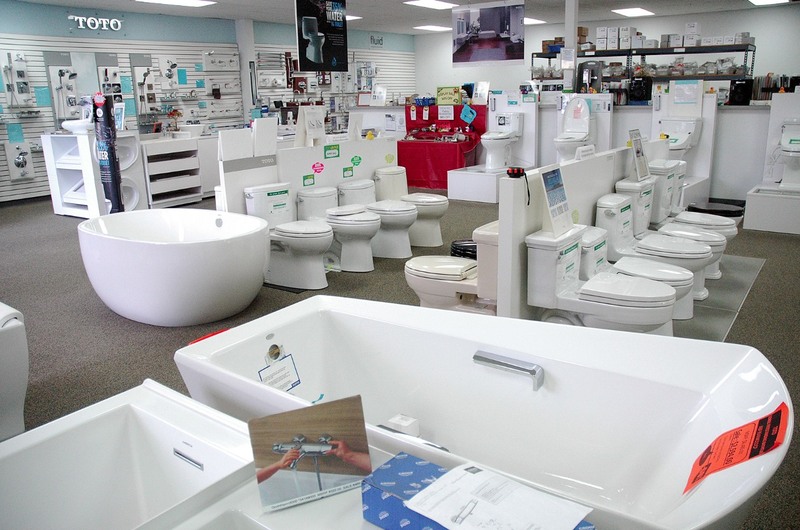 The Bathroom Store in Torrance carries a full line of Toto products, including bathtubs, faucet and shower fixtures, and the Washlet (below). A full line of Toto products is available at the Bathroom Store, the local authorized dealer in Torrance. Tomotaka “Tommy” Fujimori is the manager of the shop, and he guided me on a tour during a recent visit. The Washlet ranges in suggested retail price from $499 to $3,300 in white. For sheer “wow” value, nothing beats the top-of-the-line Neorest, Toto’s integrated toiled and fully automated Washlet. Completely without peer, it has a suggested retail price of over $10,000. Fujimori said his store sells several each month, often to Hollywood stars. Walking toward it, the seat silently and smoothly opens, and a soft LED light illuminates the way – perfect for those sleepy trips to a dim restroom. The water spray can be adjusted for location, pressure, position, and the dryer has a range of temperatures. The wand from which the cleansing water comes cleans itself before and after use, making it ready for the next user. It also incorporates ultraviolet light to eliminate any unwelcome microbes in the bowl. Frankly, once you’ve tried it, you’ll wonder how using dry paper could ever be sufficient again. Strang himself appeared in an episode of “The Kardashians” in which Kylie and Kris Jenner selected Neorest toilets for their multi-million-dollar home. Americans tend to be very pragmatic when it to comes to the tools of everyday life; adopting “a better mouse trap” is ingrained in our DNA. Anyone who’s spent any time at all in Japan knows how a Washlet at home quickly becomes one of those daily luxuries that we wonder how we ever lived without. The Bathroom Store is located at 2140 W.190th St. in Torrance, in the Sequoia Commerce Center. Call (310) 787-2400 or visit www.totospecialist.com.